Markus Hauser, from Switzerland, published a noteworthy map of Pik Lenin on the border between Tajikistan and Kyrgyzstan. He used Russian army maps as a base to portray topographic features. The addition of three hypsometric tints resulted from a shaded relief drawn by Regula Spiess. The map was printed in 6 colours (CMYK, brown and grey) and measures 42.5 × 36.5 cm. “Pik Lenin” (section) by Markus Hauser, relief shading by Regula Spiess, 1996, original scale 1:100,000. 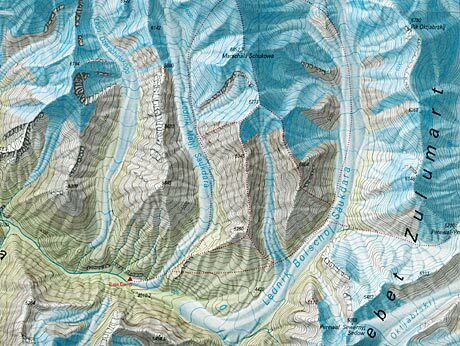 Available from Gecko Maps.